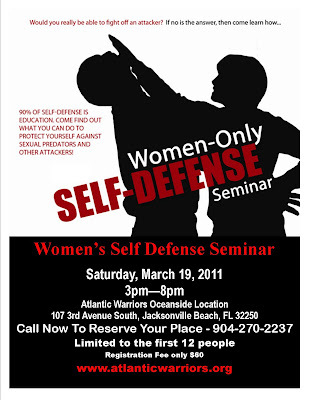 Taught by the 2010 RBF, Self-Defense Instructor of the Year for Women's Self-Defense, Atlantic Warriors special Personal Protection Course is specifically designed to teach you how to survive today's dangerous environment. By shattering the myths surrounding realistic self-defense, Jacksonville local martial arts expert, Sifu Jonathan Petree, equips women with the facts and usable skills in this unique 2-part course. Graduates will be a force to be reckoned with regardless of their size, strength or fitness level. Atlantic Warriors Oceanside Location (A.W.O.L.). Also, home of EPIC Surf Ministries. This class is only $60 (a 40% discount). To Reserve your place now: Email sifu@atlanticwarriors.org, or call our office at (904) 270-2237.